A little podcast that became one of the most popular. A series of strange stories about a small town. An exploration of dark comedy and Lovecraftian horror. A place where the dog park is dangerous, and the Sheriff’s Secret Police are always around—and watching, and The Faceless Old Woman Who Secretly Lives In Your Home flips tables for the fun of it. Or possibly to send a message. A place where Cecil tells you the news. The first podcast I ever got into, it’s clever and funny, and sometimes even disturbing—and is a perfect model of how entertainers can make money. 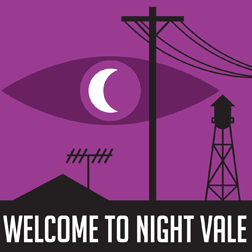 Because while Night Vale itself is free to listen to, the group behind it is smart and set up a nice little arrangement for themselves in the form of selling merchandise. As far as I know, Night Vale makes all of its money through only a couple of avenues: live shows, merchandise products, donations, sponsorships, and book sales. You’ll notice none of these things are enforced on the audience. They are all supplementary to the main, free product. And Night Vale is not the only one using this model now. This seems to be a trend. Youtubers and Podcasters and perhaps even authors are able to make a lot of supplementary money through not the product itself, but the love of the product. And it works. Because what’s a better method of advertising than free and high quality? And what is a more fun way to be a fan—what’s a more rewarding way to be a fan—than to help support the creators and get some sweet stuff out of it? So now, if you see someone walking around Clearwater wearing an odd purple shirt with an eye logo on it: you know why.